TTX (private): Developer of railcars and freight car management. Wikipedia link. Trinity Industries, Inc (NYSE: TRN): largest North American freight rail manufacturer with 30% of the market. It produces freight cars, passenger railcars, boxcars and others. Railex (private): Uses Union Pacific and CSX along with special Railex-designed, purpose-built refridgerated cars to transport produce. Railex, a refrigerated rail transport and warehousing company, began service in 2006. Guarantees five days coast to coast. Routes: Washington (state) to New York; and Delano, CA to New York. A single train is equal to 220 semi trucks. RailPower: (Canadian/U.S. stock: TSX:P) Specialized energy technology systems for transportation with its state of the art locomotives and hybrid crane power plants. CalTrain: Bay Area rail service. Provides rail service between San Francisco and San Jose, with weekday commute-hour service to Gilroy. Light Rail Now: a charitable educational enterprise designed to support efforts both within North America and worldwide to develop and improve light rail transit (LRT) and other rail transit and mass transportation systems. U.S. cities: metro and light rail (comprehensive) -- UrbanRail.net has map-based info with images and info. Alaska Railroad (ARR) -- Corporation information, sightseeing tours, fares, schedules, freight service, employment, programs, newsletter, events, and contact information. 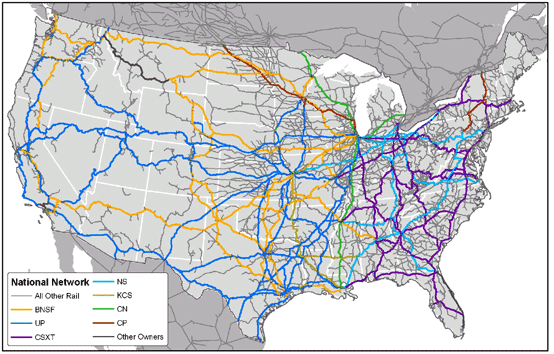 American Association of Railroads (AAR): AAR members include the major freight railroads in the United States, Canada and Mexico, as well as Amtrak. Based in Washington, DC, the AAR is committed to keeping the railroads of North America safe, fast, efficient, clean, and technologically advanced. Note: On Feb. 12, 2010, BNSF (former stock symbol BNI) merged with parent company Berkshire Hathaway Inc. (BRK-A). BNI Historical Stock Prices are here. Railway-Technology.com: European web site that contains up-to-the-minute news on the worldwide rail industry. With its unique blend of news, analysis and special in-depth reports, this resource gets to the heart of issues affecting the working lives of people dealing with technology in the railway industry. From boardroom directors to trackside staff, or third-party providers, railway-technology.com offers a comprehensive view of the industry, staying on top of the latest industry movements and views. Railway Technical Web Pages: provides free articles about railways, using the UK railway system as the base technology with more articles and information about other systems, like the US, as appropriate. Articles and glossaries are provided for a range of subjects. These include planning, finance, operations, design, engineering, production and maintenance. There is also some information about steam locomotives, including a glossary and an explanation of wheel arrangement descriptions. railwaygazette.com -- UK-/Europe-based web site and "webezine" for railway industry. Trains magazine (U.S.) from: Kalmbach Publishing Co. (Includes: Model Railroader magazine, Classic Trains magazine, etc. The Diesel Shop -- "Home to First & Second Generation Locomotives and Motive Power Rosters". Essentially a "Field Guide". Excellent, non-stock photos and descriptions. Class One is here. The American Railroads -- a website dedicated to U.S. railroad history, both past and present, and a resource tool describing and educating about American railroading in general. Spike Systems – Mostly American historical rail-fan site. steamlocomotive.com -- This web site primarily contains info on full-scale U.S.A steam locomotives. carrtracks.com -- website for western historical train symbol information. trainorders.com -- This discussion/forum web site is one of the busiest railfan sites on the internet.